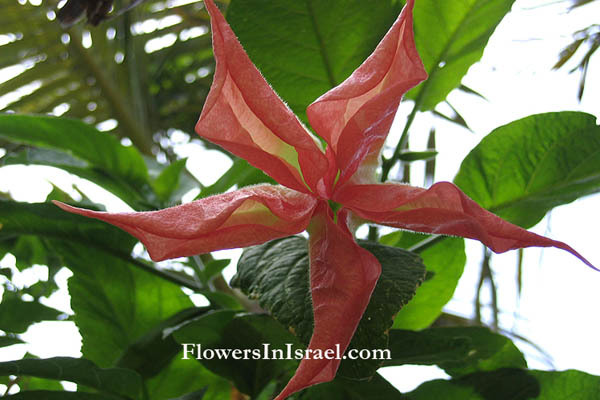 Synonym name: Datura suaveolens Humb. & Bonpl. ex Willd. Flowers: White, Yellow, Pink, orange or red pendulous trumpet-shaped flowers, 14–50 cm long and 10–35 cm across at the wide end. Brugmansia, referring to Sebald Justin Brugmans, 1763-1819, a Dutch professor of natural history. 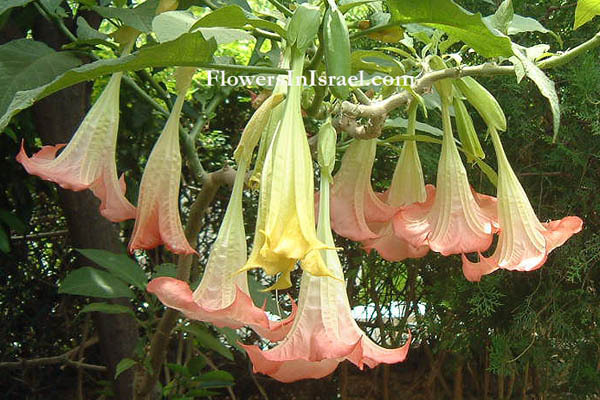 Datura, the genus name was given by Linnaeus in 1753; apparently from either the Hindu vernacular name Dhatura, or Tatorah, the Arabic name of the plant. The standard author abbreviation Willd is used to indicate Carl Ludwig von Willdenow (1765 – 1812), a German botanist, pharmacist, and plant taxonomist. The standard author abbreviation Bercht. is used to indicate Friedrich von Berchtold (1781 – 1876), a Bohemian physician and botanist from Austrian descent. The standard author abbreviation J.Presl is used to indicate Jan Svatopluk Presl (1791 – 1849), a Bohemian natural scientist. The standard author abbreviation Humb. is used to indicate Friedrich Wilhelm Heinrich Alexander von Humboldt (1769 – 1859), a Prussian geographer, naturalist and explorer. The standard author abbreviation Bonpl. is used to indicate Aimé Jacques Alexandre Bonpland (1773 –1858), a French explorer and botanist. 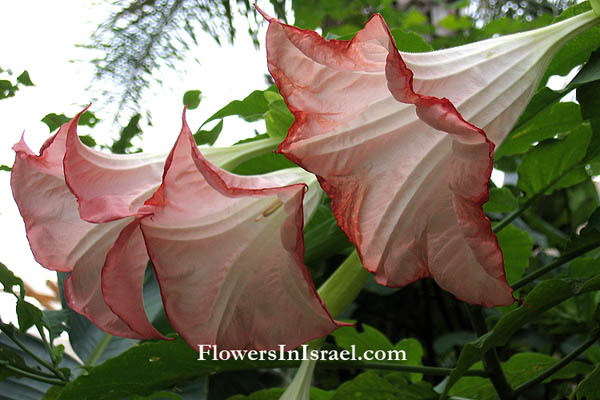 The flowers of Datura suaveolens have a mildly sweet aroma.